Saturday I went to a talk by the science fiction writer Ursala Le Guin, and the poet Eleanor Berry. Both had some curious things to say about the artists “muse.” Interesting enough, the painting above, simply titled “Muse” is part of the a new body of work I’m approaching involving creating a character in assemblage, and then doing a painting in oil of the sculpture. This work is currently featured in our faculty show at George Fox. This configuration should have some familiarity with those that follow my work, as this pairing has occurred before. The message from Le Guin and Berry seemed to be to simply be faithful and responsible to your muse, your construction, and who you are called to be in the work you are creating. I’m intrigued that as an artist I feel the muse is not something I had any say in what it would be, or how it would function. Ones responsibility as a maker is simply to follow, to listen, and to be faithful. A relationship worth investing in, with no predetermined results (like all good relationships I would asertain). Hope all is well with you and your muse…. 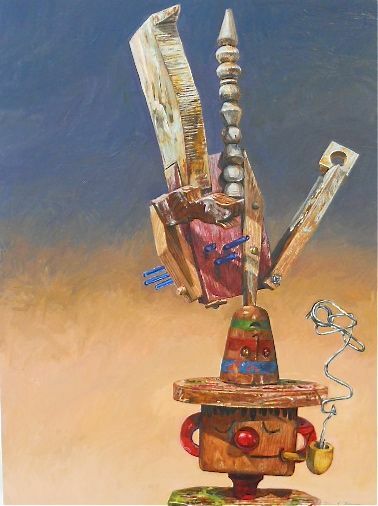 This entry was posted in Art in the Works and tagged art about the muse, realistic painting, the muse in art, trompe l'oeil, wooden figures, wooden toys. Bookmark the permalink.